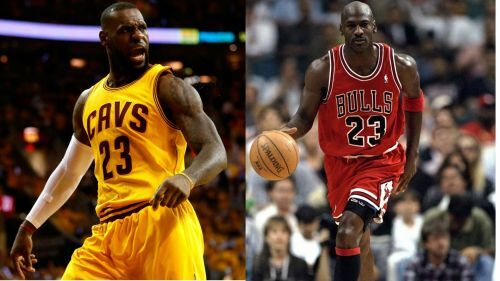 Golden State Warriors coach Steve Kerr cannot decide whether LeBron James or Michael Jordan is the greatest player in NBA history, but he is sure they are the best two he has seen. After the Warriors swept the Cleveland Cavaliers in the NBA Finals with a game four win on Friday, Kerr drew comparisons between Jordan and James. However, he was not ready to pick one over the other. "I get asked all the time about MJ, LeBron, and it's such a difficult question to ask," Kerr told reporters. "All I know is they're the two best players that I've ever witnessed. They're very different, but however you want to rank them, they're right there together." Kerr played alongside Jordan and has coached against James (including four consecutive years in the NBA Finals), so he knows the level of talent they both would bring to the court. "I think maybe the greatest testament to LeBron is that five years ago he was one of the top five players of all time," Kerr said. "From five years ago until now, it seems like he's 10 times better, because he's added so much skill to his game." Even though the Cavaliers lost game four, Kerr heaped praise toward the four-time MVP. "Well, he's terrifying," Kerr said. "He really is. Every time he comes down the court, getting downhill, you just know he's either going to get to the rim or he's going to find one of his shooters for a 3-point shot. He's added the 3-point threat. "When we came here three years ago in the first meeting, we weren't fearful of his shot. We were fearful of his power and his penetration and his passing, but now you fear everything."